Foundation North staff and trustees joined the GIFT grantee and stakeholder community last night to celebrate the completion of the second year of GIFT grantmaking, and the publication of the GIFT Year Two report. Held at Sustainable Coastlines' Flagship Education Centre in Auckland's Wynyard Quarter, the event was opened by Foundation North's kaumātua Kevin Prime with a welcome address from CEO Jennifer Gill. Presentations by GIFT trustees Toni Millar, Romy Udanga and Michelle Tsui drew attention to Year Two achievements, learnings and the next steps for GIFT. Read the full report here. As with most GIFT hui, it was a chance for grantees to meet, make connections and be inspired by each other. The Centre for Social Impact's Rachael Trotman and GIFT's Innovation Advisor Louise Marra spoke about their roles in exploring mauri and in wrapping support around the GIFT grantees, who were well-represented on the night with presentations by Sue Neureuter (The Noises), Steve Hathaway (Young Ocean Explorers) and James Muir (WaiNZ). A special 3-minute animation of the Year Two report has been designed and produced by GIFT intern Sumin Ha - watch the animation here. We are excited that three of the projects we support through our Gulf Innovation Fund Together (G.I.F.T) initiative are attracting media attention right now. Researchers from NIWA (National Institute of Water and Atmospheric Research) are heading out on the Hauraki Gulf this week to find out more about the nurseries of young snapper. A G.I.F.T grant is being used to extend the areas being habitat-mapped by echo-sounder technology aboard the organisation’s vessel Ikatere. Meanwhile in a South Auckland classroom today, a group of Year 7 students from Kedgley Intermediate School became some of the first young people on the planet to try out the NZ-VR Project – an educational resource which allows the viewer to experience the underwater world of the Hauraki Gulf (both pristine and endangered) in vivid 360 virtual reality. New Zealand Geographic, the Sir Peter Blake Trust and WWF are behind the series of experiences which can be accessed by anyone with a device connected to the internet. Go to vr.nzgeo.com to instantly connect with what few of us have seen with our own eyes. This short promotional clip is a taster of an educational tool developed by Michael Jessup, in conjunction with Sustainable Coastlines. The full experience will be available soon. The Neureuter family, have been guardians of the Noises group of islands for over 80 years. In this clip, Sue Neureuter and her brother Rod, explain why a co-managed marine protected area for the Noises group of islands is needed. Marama Beamish, project co-ordinator at Te Toki Voyaging Trust, had a dream to create a rangatahi kaitiaki programme for her community around Umupuia Marae, close to Maraetai. A G.I.F.T grant of $50,000 supported Te Toki Voyaging Trust to run such a project in early 2018. The aim was to empower Ngāi Tai rangatahi (young people) to engage with elders and Iwi leaders, Māori scientists and facilitators, waka experts and the wider community, in a four-day programme based on the water and land around the marae. This pilot project connected the young people with their role as kaitaiki (guardians) and allowed them to better understand their natural environment, not just using Western science and technology, but also through matauranga Māori – in particular through their pepeha (ways of introducing yourself). Kelly Wachowicz is Managing Partner and CFO of the Catch Together project and Catch Invest, a US-based not-for-profit that supports innovative conservation endeavours. Foundation North talked to Kelly on a visit to New Zealand about her career, the global marine environment, and the potential for impact investment to improve outcomes for fishers – and fisheries. GIFT are partnering with Fishackathon to bring a local flavour to this international event. Fishackathon brings together coders, designers and technology focused participants to solve ocean sustainability issues. Environmental restoration, conservation and sustainability in the Auckland and Northland region is to get extra support as a result of an agreement between Auckland University and Foundation North. Is a high-value, low-impact Hauraki Gulf fishery feasible? We talk to Dr Nigel Bradly of Envirostrat on the potential for a high-value, low-impact Hauraki Gulf fishery. Nigel is leading a team doing a feasibility study on the subject. 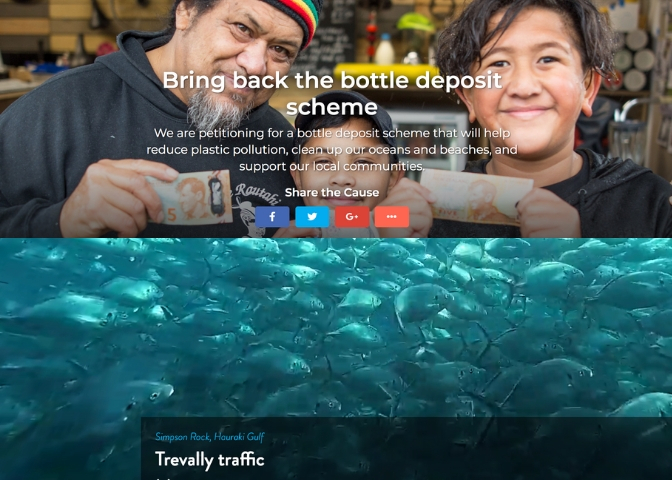 The study is funded by a grant from The Gulf Innovation Fund Together; G.I.F.T - a $5 million Foundation North fund to ignite innovation to improve the mauri of the Hauraki Gulf.